Optical Computing or Photonic Computing is a computing concept that uses photons for digital information processing while conventional computers uses electrons. Photon Computer is possibly a substandard terminology, instead Photonic Computer is used. Optical Computing uses light instead of electricity (i.e. photons instead of electrons to manipulate, store and transmit data. Photons follows fundamental physical properties different from that of the electrons and researchers have tried to make use of these properties, especially using the basic principles of optics to produce computers with performance and/or capabilities greater in Optical Computing than those of conventional computers. Optical Computing or Photonic Computing is still in the early stage : functional optical computers have been built in the laboratory, but none have progressed beyond the prototype stage. Photons have the property of not creating magnetic interference, do not generate heat and transmits very quickly. The optical transistors are much faster than electronic transistors. Optical computers may be more powerful than conventional computers today. Researchers have tried to develop optical computers since the early 1970s. Significant progress has been made in the 1980s, but the technology is still in its infancy. 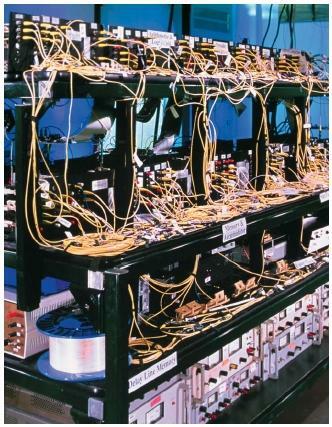 In 1990, a team of Bell Labs led by Alan Huang built the first optical computer, a computer consists of a series of lasers , optics and mirrors and can only make additions. Many difficulties of implementing an optical computer or optical computing is, especially the miniaturization of optical components, making a hypothetical computer purely optical in the near future. However, we hope to use this concept for solving problems, with mixed computers. Photons, however, has some advantages : it uses the three dimensions of space, since the propagation direction is associated with two perpendicular directions. Any lens generates an image on an algebraic operation extremely useful for processing of two variables (the two directions perpendicular to propagation). Without going into detail, this is the basis for many specialized applications, such as image recognition. In terms of computing power, the optical transistors are very fast, optical computers can give very impressive performances, up to 5 x 10^12 operations per second (5 Tera FLOPS) . Comparison with the electronics must be done with specialized integrated circuits for signal processing operation and therefore have much higher performance than those of microprocessors: a signal processing circuit for motion analysis of video images, including one million transistors divided into 256 processor has a computing power of 14000 MFLOPS , whereas the same size and microprocessor technology achieves only 50 MFLOPS. Most research projects are focused on the replacement of existing computer components by optical equivalent, resulting in an optical digital computer system that processes binary data. This approach appears to offer the best short-term prospect for commercial optical computing, since the optical components could be integrated into traditional computers to produce a hybrid optical / electronic computing system. Other research projects take a nontraditional approach, trying to develop entirely new methods of computing that are not physically possible with electronics. The fundamental building block of modern electronic computers is the transistor . To replace the electronic components with the optical equivalent, an “optical transistor” equivalent is what that is required . This is achieved by using materials having a nonlinear refractive index. In particular, there are materials where the intensity of the incoming light affects the intensity of the light transmitted through the material, in a manner similar to the response voltage of a transistor. This effect of “optical transistor” is used to create logic gates, which in turn are assembled to high-level components like the CPU of the computer. Another advantage of the optical computing is acclaimed is that it can reduce the energy consumption, but over short distances, optical communications systems typically use more energy. This is because the shot noise of an optical communication channel is greater than the Johnson-Nyquist noise (also known as thermal noise) of an electrical channel, which in information theory means that we will require more energy to achieve signal of same capacity. However, over longer distances and at higher data rates, the loss in power lines is sufficiently larger than in optical communications, which will use a comparatively lower amount of energy. As the speed rises communication data, this distance becomes shorter and thus the prospect of using the optical computing systems becomes more practical. This Article Has Been Shared 4461 Times! Northbridge and Southbridge are mapped areas with some important components of a Motherboard. Every computer has a motherboard and Northbridge and Southbridge. Power Supply Unit or PSU is a hardware that is responsible for converting the consumer supply current to consistent electronic circuit current of computer. Cite this article as: Abhishek Ghosh, "Optical Computing or Photonic Computing," in The Customize Windows, February 10, 2013, April 26, 2019, https://thecustomizewindows.com/2013/02/optical-computing-or-photonic-computing/.